← I’ve Got One Hand In My Pocket, and the Other One is…. I have a lot of trouble being in the present moment. I’m either too nostalgic, living in the past and wishing to go back there, feeling guilty for things that went wrong in my life and the lives of those around me, or I’m fretting about the future, worrying about things that either won’t happen at all or will inevitably happen, and wishing for some magical date in the future when I’ll be the person that I want to be. I went through some old pictures last night while I was waiting for Joey to get home from school. After my good, obligatory sob-fest looking back over pictures of Puss and Papa and my carefree days in college, I did find two pictures that made me smile. Both are at Planet Hollywood in Myrtle Beach, SC, and I think they were taken in September of 2000, while I was a sophomore in college. 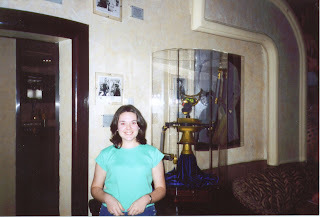 The first is of me with Crow from MST3K, which remains to be one of my favorite shows of all time; it remains to be the show that Joey and I watch most frequently (my mom had the foresight to tape them from the Sci Fi Channel when it aired on Saturday mornings). 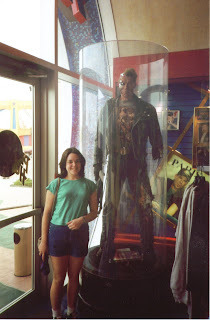 The second is of me with the Terminator from T2, which is still my favorite movie. I was so excited to be next to that figure of him that was used for the special effects of the film. I didn’t have as much trouble being in the present moment back then….I guess it was because I didn’t have as much responsibility, as much riding on my ability to handle things and to take care of everyone. I was the one being taken care of by those around me. I know that was probably a selfish place to be, honestly (but natural for someone who is still dependent on his or her parents), but there has to be some way to be able to get there now. I’ve been feeling overwhelmed lately with everything. So, I would really like to be able to learn to be in the present moment and not to worry so much about yesterday or tomorrow. Advice is welcome, even if anonymous. I don’t know if it’s advice or just some food for thought but what came to mind is, what is really riding on your shoulders? I know you’re a believer, so you have to ask yourself, is it all *really* on your shoulders or do you just feel that way? I always like the analogy someone gave of the toddler in the back of a car with a toy wheel thinking he is really controlling the “big” car… 🙂 And another question that helps me is “What is the worst thing that could happen” (should I fail this test, or should so and so not happen, or should this happen). It’s often not as bad as we think. Living in the present is something I struggle with too but am working on breathing. I tend to breathe shallow, and taking attention to breathe deeply forces you (me) to think actively about breathing, and living, and I like to make God a part of that breathing process. Have you read Eckart Tolle A New Earth? It talks a lot about the present and is amazing!